Notes: Knight of the Garter. The Complete Peerage vol.V,pp.9-10. The Complete Peerage does not show the children. Eldest son of Thomas Howard, 2nd Duke of Norfolk by his second wife, Agnes Tilney. Educated at Trinity Hall, Cambridge, under Gardiner, and came to court at an early age. In 1531 Howard went on his first embassy to Scotland, and was entertained by James V at St. Andrews. His mission seems to have been to propose a marriage between James and the Princess Mary. He was liked and trusted by Henry VIII and was with him at Boulonge; and at Anne Boleyn coronation was Deputy Earl Marshal; and he was sent on missions to Scotland and France. In Feb 1534-5 he went to Scotland to invest James V with the Garter (State Papers Henry VIII, v. 2 ; Diurnal of Occurrents, Bannatyne Club, 19). Chapuys, who suspected much more than was really designed by the mission, added, in his letter to Carlos V, 'People are astonished at the despatch of so stupid and indiscreet a man'. But Queen Margaret on 4 Mar wrote to Henry, commending Howard's 'honorable, pleasaunt, and wys' behaviour. King James V, who a few days previously bore similar testimony, offered him the confiscated lands and goods of James Hamilton, the sheriff of Linlithgow, brother of Patrick Hamilton. These Howard refused, and Hamilton was restored to favour. In 1535 he was in France on diplomatic business (Chronicle of Calais, Camd. Soc. p. 45). In Feb 1535-6 Howard was again sent to Scotland, in company with William Barlow, the bishop-elect of St. Asaph, to recommend to James and his court the adoption in Scotland of Henry's ecclesiastical policy. Howard was instructed to set forth 'his grace's proceed-inges', and to 'inculce and harpe uppon the spring of honour and proffit'. He had also to propose to James an interview with Henry. He returned to Scotland once more in Apr 1536 (Hamilton Papers, i. 29, &c.; Diurnal of Occurrents, p. 20). Lord William Howard of Effingham, through his wife Catherine, succeeded to the Manor of Gaines, and was succeeded by his daughter Agnes. In 1537 and 1541 Howard was engaged on an embassy to France (cf. State Papers Henry VIII, vol. viii. pt. v. contd.) While there Cromwell informed him and his colleague, the bishop of Worcester, of the death of Jane Seymour, and, at the King's request, asked them to report which of the French princesses would be suitable for her successor. His wife, Margaret Gamage, was one of the ladies of his sister, Queen Catherine Howard. In Dec 1541, when Catherine was arrested, both Margaret and her husband were tried and found guilty of concealing her unchastity. They were later pardoned. They lost, however, the manor and rectory of Tottenham, which had been granted to them in 1537 (Newcourt, Repertorium, i. 753). 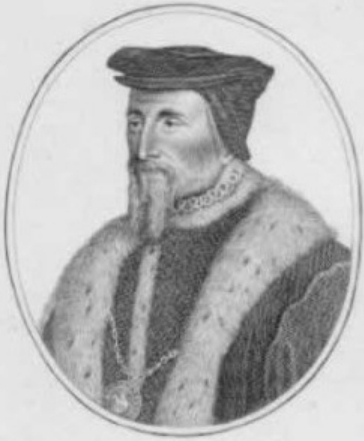 Howard accompanied the Earl of Hertford in the invasion of Scotland of 1544. In the same year he took part in the siege of Boulogne, and in 1546 one of the many orders in council directed to him instructed him to prepare ships for the 'sure wafting' of the money which Wotton and Harrington were to convey to the army in France. From 29 Oct 1552 to Dec 1553 he was Lord Deputy and Governor of Calais, and 14 Nov 1553 Lord High Admiral; Lord Clinton, however, the former admiral, did not resign at once, so that the patent was not made out until 10 Mar 1553-4. In Oct of that year Privy Councillor under Edward VI. On 2 Jan 1553-4 he received the Spanish ambassadors at the Tower wharf, and rode with them up through the city to Durham Place. William was made Knight of the Garter in 1554. When Sir Thomas Wyatt approached London, Howard was very active in the defence of the Queen. He shut Ludgate in Wyatt's face. 'And that night' (3 Feb 1553-4), says Wriothesley, 'the said Lord Admirall watched the [London] Bridge with iii c men, and brake the drawbridge, and set rampeers with great ordinance there'. Created Baron Howard of Effingham 11 Mar 1553/4 for his defence of London during the rebellion. The manor of Effingham (Surrey) had been granted to him by Edward VI in 1551. Perhaps his arguments with the Queen saved the life of princess Elizabeth after that affair. He befriended Elizabeth, but his popularity with the Navy saved him from Mary resentment. He became Elizabeth's principal protector during the months that followed. By the next year his loyalty to the princess made him a suspected person; the Imperial Ambassador wrote to his master that it was "highly probable" that Howard knew of and consented to plots in which Elizabeth was believed to be involved. In Apr 1555, he urged in Council that her restrictions be removed and that she be brought back to Court. In 1554 he remonstrated with Gage for his ill-usage of the princess, had a conversation with her in the Tower in 1555, and when in 1558 Elizabeth came as a prisoner to Hampton Court, he visited her, and 'marvellous honorably used her grace'. His obvious support of the heir finally brought him the loss of his great office of Lord Admiral. He met Felipe of Spain when he came to England at the Needles, and though there were fears that he would carry him away to France, he brought him safely to Southampton. In 1555 he conveyed Felipe to Flanders. But he was still exposed to suspicion, the popularity that Elizabeth and her cause brought him made Howard a dangerous enemy, so Mary found it expedient to mollify him with a pension and finally with appointment as Lord Chamberlain. In 1558 Mary designed to send him on an embassy to France, but he was too ill to go. When Elizabeth became queen he had great influence with her and filled several important posts. He was reappointed Lord Chamberlain and resumed his diplomatic role. Early in 1559 Lord Howard, accompanied with his eldest son, Charles, went as negotiator to the peace conference at Cateau-Cambresis. He supported the Queen against the northern earls in the rebellion of 1569 and in 1572, ceased to be Lord Chamberlain on becoming Lord Privy Seal. Margaret, Lady Howard of Effingham, was listed among the ladies of honor in 1558/9. In 1578/9, she took delivery of New Year’s gifts for the Queen. Her name is sometimes written as “Lady Haward”. There was a portrait of Margaret Gamage in the Pembroke collection in 1561. William Howard was one of the considerable body of Elizabethan officeholders who went to their graves complaining that they were being driven into beggary by their sacrifices to the Queen's service. No doubt the complaints were uttered partly in the hope that travail would be rewarded and because their expense and responsability stood as evidence of the Queen's trust. But with Lord William the whimperings of sacrifice seem to have been justified. He received pensions and lands and had access to the Crown which should have brought a shower of gifts from office-seekers. But his expenses at court were high, his large family included several daughters to be married off, and the offices in his direct gift were not many. As a result he was never able to build more than a modesdy comfortable landed estate. From his father he had lands worth not quite £100 a year, but all except the manor of Little Bookham in Surrey had quickly been sold. From Henry VIII he had received Reigate Priory -which became one of the principal family residences and stayed in the hands of his descendants through the seventeenth century- Eastbrooke and Southwick manors in Sussex, West Humble in Surrey, and the priory of Barnstaple in Devon. From Edward VI, Howard got Great Bookham (an important Surrey manor), the smaller manor of Effingham from which he took his title, and a moiety of Reigate Manor. Mary gave him lands in Devonshire and Somersetshire, which he sold, and Elizabeth added the manor of Kingswood Liberty. In 1560 Howard bought Blechingley (valued at £45 a year), with another important residence and influence over a parliamentary borough, and lands at Lingfield, Hackstal, and Billeshurst. The properties, most of them in Surrey, were worth altogether about £400 a year. Salaries and pensions provided him with as much again, but he found that his total income of £86i 6s. 8d. was totally inadequate to meet his needs. In a document prepared for the Queen about 1565, he said that his expenses exceeded £l,500 a year without reckoning anything "put in to my persse for to spend in hawkyng and hontyng & in rewards gyvyn for my pleasiuir" or for repairs to his house or for the dowry of two hundred marks a year for his eldest daughter. His expense for going on progress ran to two hundred pounds a year, and gifts and rewards at Christmas and New Year's cost another hundred pounds. He was £2,OOO in debt and saw no way to recover himself or to provide a living for his younger children without a substancial gift from the Queen. Of course, William Howard may have been exaggerating the disparity between income and expense in the hope of maximizing the grant to relieve it. But certainly he thought that he was being ruined in his service to the crown and that the Queen should lift him up from poverty. In the next few years, he did make some kind of settlement with his creditors without selling any more lands, but he remained relatively poor for the rest of his life. There is a story that during his last years he begged to be made an Earl but was refused because he lacked the means to support such a dignity. Lord William's friendship with the Queen and his recognized fidelity to her interests during difficult times had created a fund of good will upon which his son Charles could hope to draw. But it might also be possible to argue that during his last years Lord William, by occupying one of the major offices, may have kept Charles from receiving important preferment. Charles's father, however, was evidently declining by 1570, which mar have meant that Charles took over some partion of the chamberlain's duties. By the end of 1572, Lord William was no longer able to carry on and gave up his staff. But because he still needed any salary and perquisites the crown could supply him, he was made Lord Privy Seal, an officer whose responsibilities had become insignificant. He condnued to decline, and late in Jan 1573, he died "full of years and honour, being of most approved fidelity and unshaken courage". He was buried, in accordance with a will drawn up in 1569, in the church at Reigate. By the terms of the will, he did not leave his son a rich man. Most of his properties had been settled by another instrument, which does not survive; the will mentions only the manor of Esher, which was to go to Charles along with his robes and collar of the Garter (a grant contrary to the statutes of the order). The younger son, William, got a small money grant, and the rest of the estate after debts were paid went to Lady Howard, who was asked to see that dowries were pro vided for daughters still unmarried. The language used concerning Esher implies that the manor was in Lord Howard's possession, but it had been given by Mary to the bishops of Winchester, who still held it in 1573. What Howard may have had was a promised lease, since Charles did get a lease in 1578 by threatening that if Bishop Horne would not co-operate he would "compass his object in some other way, without any regard for the Bishop's feelings". From sources other than the will it is known that the lands at Lingfield and Great Bookham were settled on the younger son and that Reigate and its lands went to the jointure of the widow. When she died in 1581, Charles Howard paid a livery fine of £58 3s. 6d. for delivery of lands into his possession.